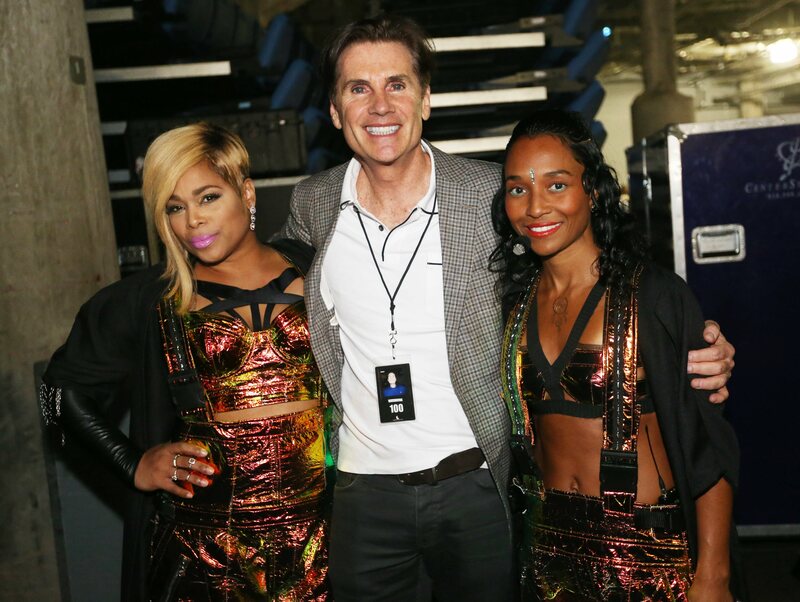 TLC’s longtime manager Bill Diggins with T-Boz, left, and Chilli, grew up in Buffalo. Diggins uses a management system for TLC’s business that generates weekly financial reports. Through last week, TLC’s tour expenses were 20 percent under budget. Chilli’s musical partner of 23 years, Tionne Watkins – you may know her as T-Boz – walks in. Like Chilli, she’s wearing shiny gold overalls over a black sports bra and tights. T-Boz sits on the floor and starts nuzzling Chilli. “Do not take your clothes off,” T-Boz whispers. She needs Chilli to stay dressed for a photo. “Please, please?” T-Boz puckers her lips and starts pecking the side of Chilli’s face. In the back of the room, a man unfurls a long laugh as he watches these two Atlanta-bred music stars tease each other. At 57, Bill Diggins, tall and lanky, with wavy brown hair, light skin, a white golf shirt, plaid sports coat, gray slacks and brown slip-on dress shoes, looks like a stylish businessman straight out of Irish-Catholic South Buffalo. And that’s what he is. But this place – in the room with Chilli and T-Boz, the remaining two members of the legendary group TLC – is exactly where he belongs. Eighteen years ago, when TLC’s music was flooding the radio and MTV but the group was clawing out of bankruptcy, Diggins convinced the members to hire him as their manager. He made them a big commitment, set a daunting goal and delivered on both – but he’s not nearly done. As Chilli, 44, and T-Boz, 45, were unwinding in their dressing rooms, several thousand 30- and 40-something fans, mostly women, were dancing in the arena. But it didn’t take New Kids – the headliners on “The Main Event” tour, which wrapped up its two-month run with the Buffalo show – to lift those ladies out of their seats. TLC took care of that. Even without their third member, Lisa “Left Eye” Lopes, who was killed in a 2002 car accident in Honduras, and even without a chart topper for 15 years (their last was “No Scrubs”), the group remains a draw. Their 45-minute set was loaded with hits: “Waterfalls,” “Creep,” “Unpretty” and “Baby Baby Baby” among them. Diggins, who’s based in San Francisco, where he also runs a technology company, doesn’t travel to every tour stop. The last shows he caught were at Madison Square Garden in New York City, where he watched with his longtime friend, the music mogul L.A. Reid, and talked about his next goals for TLC: One more hit record, and then election to the Rock and Roll Hall of Fame. The latter goal, though big, is reasonable: TLC’s cross-genre (R&B, pop and hip-hop) and cross-cultural appeal stands out; their enshrinement is more a question of when than if. As for more smash music? “The hit record is elusive for acts that have been around for quite a while,” said Diggins’ friend Bryan Turner, co-founder of Priority Records. Diggins acknowledges that. For him, the allure lies in the deep challenge. Sitting last week on a cream-colored couch in the South Buffalo home where he grew up, Diggins recounted his days as a Buffalo school kid (He attended St. Thomas Aquinas, then Stella Niagara; he didn’t get a college degree. ); his decision to move to Los Angeles to sell welding rods for his uncle’s company; his early successes (By 22, he had earned enough as a salesman to buy a house in Bel Air. ); and using his self-made Southern California connections to work his way into the music business, working with such acts as Billy Idol, Johnny Rotten and Bjork. Eighteen years ago, that tunnel-vision focus landed Diggins the job that will likely define his musical legacy and, in the words of his friend Turner, “literally saved” TLC. In the mid-’90s, despite a string of hits, the group declared bankruptcy. TLC parted ways with multiple managers and wanted to break out of a record deal the members felt was choking their business. Because TLC was one of the hottest acts in the world, multiple big-name managers were lining up for the chance to represent T-Boz, Left Eye and Chilli. That’s turned out to be true, but with tragic challenges. Lopes’ death in 2002 hit team TLC hard both personally and professionally. But when T-Boz and Chilli were ready to re-emerge, Diggins was standing by with ideas. He lined up a couple of reality shows designed to keep TLC in the public eye and, more notably, helped sell the idea of the biopic to VH1. The film was a resounding success: It was the most-watched cable movie for adults in 2013. If anyone wanted to know whether a project was done, he wouldn’t answer the question, but rather referred them to the Teamwork tool. Even Chilli and T-Boz. They’d ask Diggins questions, and every time he’d refuse to answer. He wanted them to lead by example, so he told them to log into Teamwork like everyone else and access the information. Chilli, still leaning into T-Boz in the dressing room, laughs. “I love his persistence.” She often uses Diggins as an example of persistence for her 18-year-old son Tron, who calls the manager Uncle Bill. When the tour wrapped here Thursday night, it was time for a break. The ladies of TLC rose to their feet. Chilli needed to shoot those photos then get onto her bus to Atlanta. T-Boz was flying out the next morning. But not for long. There’s music to record. A tour to plan. A hall of fame to pursue. And, most dauntingly – which for Diggins, means most enticingly – a hit to create. Tim O'Shei – News reporter Tim O'Shei has been a journalist for more than 20 years, covering pop culture, business, sports, politics and more.